he Trump administration seems to have found their man in National Assembly leader and self-appointed president of Venezuela Juan Guaidó. Guaidó has been extremely attentive to US interests, promising to allow US oil companies to increase their activity in Venezuela. Are there any true liberals who aren’t cheerleading the demise of the mainstream media? Tools of the oligarchy, at this point I’m embarrassed that they purport to present the facts. I’d suggest only one correction to this otherwise excellent article. In the first paragraph, there’s a rather unfortunate formulation “right-wing nations,” which I find problematic. I’d replace it with something like right-wing governments. I’d add that a ‘(sic)’ would have been appropriate in the title after ‘by Definition’. And therein sits a media scrum piece of the Mercer/Bannon/Conway hot-foam-churning: to make any and all ‘chosen points’ in an interlocution appear definitive. The human mind then has exclamation point stoppers at every synapse. This in turn make the jaw drop and thought stop, though babble continues to issue forth. IN Washington DC the definition of “moderate centrist” in the US and abroad has leaped rightward during the past half century. While Nixon was a moderate centrist by 1969 standards, by 2008 his track record put him to the left of Obama, Today he would be considered too far LEFT to be considered for the DEMOCRATIC Party nomination. The GOP and their FOX network (faux noise) would brand Nixon as a traitor. Max Blumenthal has been doing good research and reporting on Venezuela. With few exceptions, the mainstream media, establishment politicians, and pundits continue to ignore information that is not cheerleading for a US coup. 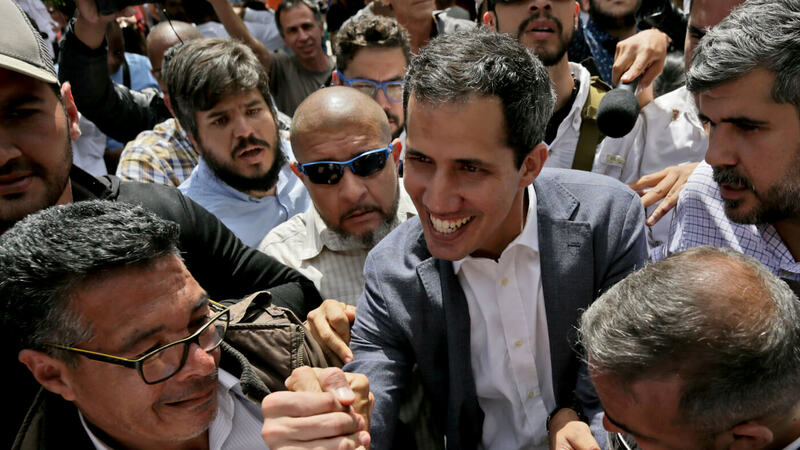 How the United States National Endowment for Democracy crafted Juan Guaido as a tool for regime change in Venezuela. there is a little ditty about the UK media that is applicable to the US. I appreciate this article calling crap on the labeling of these folks as ‘moderate centrists.’ Thank you. But I call crap on this article for not saying what these folk actually are: FASCISTS. Guaido is a CIA fascist strong man wannabee. He’s a Pinochet inside and a Beto O’Rourke outside. I love RT.com, but some things on any site you have to take with a grain of salt. RT is usually either far right or far left and the far right I just ignore. They are definitely not centrists. So they are complaining today about Google news and searches. They cite a Google researcher named Epstein as saying that Google searches are swayed liberal therefore and towith have moved elections in a major way. Epstein thinks that people don’t understand this lurking evil. He also calls Yahoo centrist. My take: Google is rank centrist, Yahoo is mostly right though sometimes it appears not–just check the comments. A leftist commenter will sooner or later be asked to reregister and be unable to do so. I know that the world trusts media way too much, but I believe that anyone able to do a search has experienced trash and sees it for what it is.